This huge natural Australian gold nugget is shaped like a bear on one side. Turn it over and turn it sideways and it looks kind of like a cow carrying a load on it's back. 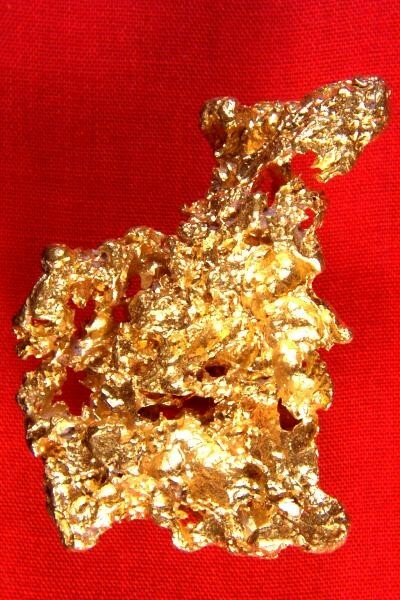 Weighing in at 2.05 Troy Ounces (63.8 Grams), the surface area is very large at 1.875" long x 1.25" wide. 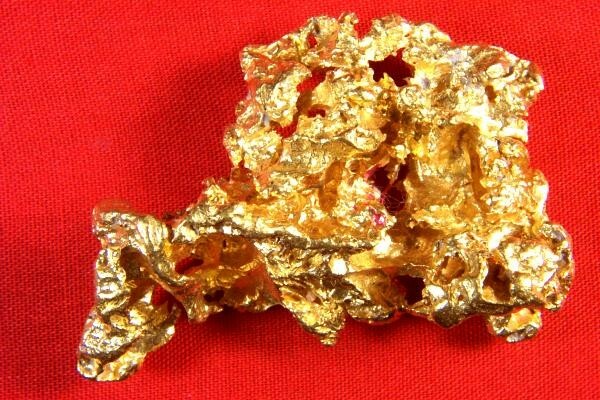 This rare and beautiful Australian gold nugget is truly amazing. I have the largest collection of special shaped natural gold nuggets that you will find anywhere. I have searched many gold nugget collections to put together this collection. These are all one-of-a-kind gold nuggets and it is not often that you find one in such a distinct shape as this. Australian gold nuggets are very pure 22KT - 23 KT (92% to 98% pure), making them some of the purest gold nuggets in the world.